Hey guys you look kawaii. From left to right (clockwise): Raffi, Liam, Sandra, and Birch. 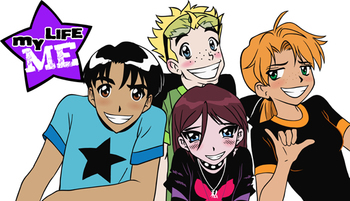 My Life Me is a Canadian/French animated series that follows the exploits of junior high students Birch Small, her cousin Liam Coll, Sandra Le Blanc, and Raffi Rodriguez. It employs many Japanese Visual Arts Tropes, and the main character Birch is an aspiring manga artist. The series attracted a lot of attention from 4chan's /co/ (not much of it positive), due to its animesque design and tropes, and its online "manga" maker , which is extremely easy to exploit. All-CGI Cartoon: Surprisingly animated via Toon Boom Harmony of all animation softwares, and it's very noticeable. All Love Is Unrequited: Birch for Raffi, and, seemingly, Liam for Sandra. Raffi again, though he has a Hispanic surname. Mr. Towes, though he might be black. Animesque: So much, it's basically a wannabe anime in Toon Boom. As Long as It Sounds Foreign: Birch's manga idol, Miyazaki Lee. That's two surnames in different languages. Blush Sticker: Everyone in this series is blushing all the time. All the time. Brief Accent Imitation: Mr. Towes does this quite a bit, just for fun. Canis Latinicus: "Agnosco" is Latin for "I understand", not "Do you understand?". The Cheerleader: Amelia is one of these. Color-Coded for Your Convenience: Birch's color palette is mostly violet; Liam's is green; Sandra's, orange; Raffi's, blue. Creator Cameo: The three fangirls who are following Raffi all the time? They are apparently modeled after the creators of the show. Cross-Popping Veins: Used just about every time anyone gets angry. Chuck Cunningham Syndrome: If someone from the main cast has a love interest outside of their group, that person usually is mentioned only in that one episode, and then never again. Made odder by both that they usually get the love interest and that the interest remains an extra (and so will share any general dislike of the main character that occurs). A Dog Named "Dog": Neko the cat. Snix: Why do they hang out with that orange chick if all they ever do is fight with her? CJ: It makes for an interesting show? Snix: Do these actually exist? Fiery Redhead: Sandra le Blanc fits this trope well. Game Show Appearance: In episode 1, the main characters participate in a fictitious game show. Good Angel, Bad Angel: Birch has a pair arguing over whether she should cheat on Liam's test. For some reason, Birch's necklace has the "watashi" kanji on it. She also has a cat named Neko. Also, Sandra has a stuffed rabbit named Kimiko. And they keep using manga as a catch-all term for... anything Birch and Liam are into. At one point, a Manga Poetry Slam happens, which can be summed up as just the characters saying "manga" a lot. "Manga" is even used in situations that words like "comics" would fit better. It's All About Me: Birch certainly seems to think that everything is about her. Even when some of the episodes focus on the other people in the pod, either Birch gets heavily involved with the episode or a Birch-centric subplot is squeezed in. Large Ham: It's very obvious that Mr. Towes' voice actor is just having oodles of fun. And the viewers ADORE him for it. Limited Wardrobe: Nobody changes their clothes in this school, for some reason. Occidental Otaku: Birch Small especially. The rest of the cast, to a slightly lesser extent. Only Six Faces: All characters' faces are based on the same design template. Remix Comic: Incredibly simple and diabolically fun, thanks to the manga maker. Sadist Teacher: Mr. Towes slips into this briefly when he suspects Birch's pod cheated on a test. School Newspaper News Hound: This show has one of these. Short-Runners: Only ran for 52 Two Shorts episodes. Then again, unless it's a major Canadian-American co-production like Johnny Test or Total Drama, Teletoon does this a lot, mainly to keep the short-lived in-house shows alive as mid-day filler to fulfill Canadian content regulations when they're not running Cartoon Network shows. Small Name, Big Ego: Birch, oh so very much. When she shows off her own "manga art" to her manga idol Miyazaki Lee, he says it's good and that she has potential, but then insults a different 'local' comic that he had seen, not knowing that Birch had drawn it. This prompts her to overreact and yell at him, insulting some of the very work of his she was praising earlier. Super-Deformed: Used liberally, along with high-pitched voices and Sweat Drop. True Art Is Incomprehensible: In-Universe, the reason that Birch lost an art competition to Raffi was that rather than turning up something along the lines of this trope, she simply drew a picture of Raffi (evidently, she wasn't listening to Mr. Towes' directions) while Raffi simply painted a canvas orange. Tsundere: Well, no slice-of-life anime-inspired show would be complete without one, so we have Sandra filling the spot. Tsurime Eyes: Birch has these. Unusual Ears: Birch would grow fox ears and a tail whenever they needed to show that she was being sly like a fox. Urban Legends: Liam told one about a janitor that went crazy from having to clean a whole cafeteria covered in barf. Visual Pun: Birch would sprout a fox tail and ears when she was being sly. Word Salad Title: According to this interview , it was originally a Working Title meant to show the characters' self-absorbed nature; the broadcaster and producers liked it, however, and it became the final title.